Author, filmmaker/camerawoman and professor Alexis Krasilovsky, along with her colleague Harriet Margolis, have been working together for over three decades on projects highlighting women's struggles for equal access to work on the production side of the film industry, as well as recognition of their contributions to the art and craft. 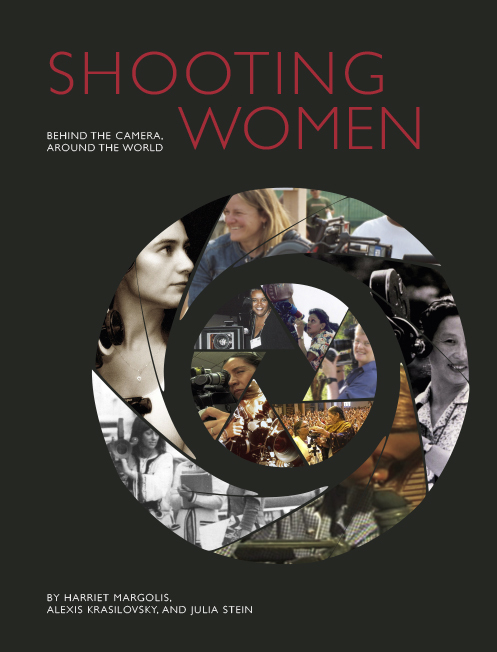 Women Behind the Camera: Conversations with Camerawomen, published in 1997, was the initial manifestation of their collaboration, which led to the award-winning documentary of the same title in 2007. The original book dealt with both documentary and feature film in Hollywood, New York and San Francisco, while the film was much broader, looking outward to embrace camerawomen from around the world. This newly published book reflects the international outlook of the film, and logically brings to light women's current plight globally, both in society and in film. Shooting Women, by Krasilovsky, Margolis and Julia Stein, is not structured as a simple linear historical chronology of women in film. Its effect is more like a kaleidoscope built around interviews with over 86 camerawomen, whose individual stories are woven in and out of the chapters, based on relevance to the subject at hand. While the information has an immediacy—all rooted in real-life experience—I found most of the chapters difficult to follow because so many names are referenced, and sometimes three or four different women are mentioned or quoted within the space of a single paragraph. After the first few pages, I stopped trying to keep track of who was who. Many names were familiar, like Barbara Kopple and Agnès Varda. For those less known, there is an alphabetical listing after the last chapter of all the camerawomen who were interviewed. The list includes brief biographies of each interviewee with a note indicating that production details for many of the taped recordings can be found at www.womenbehindthecamera.com. For any young woman contemplating a career in film production, be it documentary or feature, this book will help to provide a clear-eyed view of what that career may look like. "How Do Women Become Camerawomen?" is answered in Chapter One. The relatively low-cost and easy operation of high-quality equipment today has certainly lowered the bar of admission to the field, but some of the most compelling breakthrough stories were of women like Margery Ordway, who in 1916 was hired to work under the DP Howard Scott in Hollywood as a "regular, professional licensed, union crank-turner," or Louise Lowell, who in the 1920s studied aviation and became an aerial camerawoman for Fox Movietone News. While the authors state that the earlier film and this book were "made by women for women," men, by default, have played supportive as well as obstructionist roles, not only in the past but right up to the present moment. Many women in the book cite the supportive side of the gender divide, and among male mentors, the late Haskell Wexler is a standout. He never went to film school and he realized how important mentoring and on-the-job training was to him, so he spent much of his professional life "offering technical information, providing hours of work so women could join the union, and championing the cause of camerawomen generally." Chapter Three is devoted to "Documentary: A good and satisfying career choice that is statistically friendlier to women than feature fiction filmmaking." As this chapter importantly points out, "Women have been filming documentaries almost from the beginning of cinema." Documentary is closely associated with "the search for truth," and generally depends on a certain amount of freedom for its survival. Therefore, I was surprised to find much of this section focused on the fascinating role documentary has played in the history of China. A small group of pioneering camerawomen tells of filming some of the most influential figures of their time, including Chairman Mao Tse Tung. Shi Shi Jun and Chen Jin Ti are among this first generation of Chinese camerawomen. Starting work in 1949 as university film school graduates, they were early participants in the nationalized film industry of Communist China. The Chinese government thought film was important both for art and propaganda. The government established many new theaters, "increasing the film audience from 47 million in 1949 to over a billion in 1959." This respect for the power of film to influence, along with the call for the liberation of Chinese housewives, convinced young Chinese women who wanted to be filmmakers that "whatever a man could do, we do just as well." Chen Jin Ti worked during the 1950s and '60s as a camerawoman in Beijing for Premier Zhou Enlai. She credits him with having confidence in her abilities, and with patience as she learned on the job. She continued to work in media for over 30 years, co-founding the Chinese Children's Movie Organization in the 1980s and becoming head producer of Children's Television at Central Television in Beijing. Both Chen Jin Ti and Shi Shi Jin furthered their work and spread their knowledge by becoming role models for subsequent generations of Chinese camerawomen. Another surprising discovery was the documentary work of Adriana and Delores Ehlers, two Mexican sisters who had studied cinematography in the United States and worked for the US government during World War I. They founded their own production company and, in the 1920s, did their own camerawork, creating newsreel footage that they sold. Then there was also the celebrated novelist of the Harlem Renaissance, Zora Neal Hurston, who did ethnographic camerawork in Florida in the '20s. The feminist wave in the 1960s and '70s brought many talented camerawomen and directors from the US, Canada and Great Britain into the field. Kopple, Christine Choy, Joan Churchill and Nancy Durham began making documentaries about civil rights, the anti-war movement and women's rights. This is a continuing trend, supported in part along the way by such influential woman "gatekeepers" as HBO's Sheila Nevins and Cara Mertes of the Ford Foundation's JustFilms, who previously headed the Sundance Institute Documentary Film Program and, before that, POV, the showcase for documentaries on PBS. In Chapter Six, "Shooting around the World," 16 camerawomen were each given an opportunity to share their personal, anecdotal experiences filming in locations ranging from New York to Kurdistan to Korea, and many other places in between. The authors' stated goal for the book was to "develop an outline of a collective figure—the camerawoman—who tries to practice her profession within a largely unwelcoming industry." However, I found that the individual voices telling their unique stories in this chapter made the most memorable impact, and added to my perception of what it takes to be a camerawoman. To achieve recognition in a male-dominated industry takes self-confidence, drive and optimism. This information-packed reference book highlights the achievements of many women in film over the past century. However, lest the book gives a false impression of progress, "women directed only 6% of the top-grossing narrative fiction films in the United States in 2013, and women cinematographers shot less than 2% of the top 250 films of that same year. Documentaries faired slightly better; women directed 28% of the successful nonfiction films in 2013-14 and camerawomen shot 12% of the documentaries in that same time period." This book on the film industry ends, as most do, holding up the hope of the digital age: The democratization of media is in the works, and "many other points of view are going to come into play. How we envision the world is no longer in the hands of the few, but in the hands of the many." It remains to be seen whether many of those hands will be those of women. Cynthia Close is the former president of Documentary Educational Resources. She currently resides in Burlington, Vermont, where she consults on the business of film and serves on the advisory board of the Vermont International Film Festival.